Burning Wood: Valerie June, Where Have You Been All My Life? Valerie June, Where Have You Been All My Life? Already out in the U.K., with an August release date for the U.S., Valerie June's "Pushin' Against A Stone" has been quietly knocking me out for the last two days. With three records already under her belt, two of them recorded in her birthplace of Memphis at the legendary Ardent Studios, and none of them coming close to my radar before this weekend, Valerie June may be on the verge of something huge with this new release, co-produced by Dan Auerbach of The Black Keys and Kevin Augunas of Florence & The Machine fame. Get inside this record. These songs, the arrangements and the attack, are big. "Pushin' Against The Stone" is full of heart, soul and sadness, and simply fantastic. Country blues, folk, gospel and Memphis soul are all represented here and Valerie June sounds like she's been doing them all for her whole life. I love "You Can't Be Told"; "Working Woman" a little less. But if Dan Auerbach is in charge, I'm definitely interested. 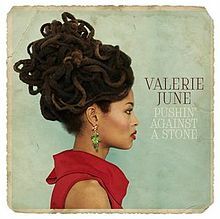 Saw Valerie June tunes on a wall post of a friend, I am in AWE~must see live~could listen to her and band all night long. Promising. I like "You Can't Be Told". Thank you, Sal! If I had ever heard of her, I wasn't paying attention. Love the clips you posted, didn't know anyone was making music like this. Am off now to find some more. She sounds a lot like Jessie Mae Hemphill and that's alright. Looks like she hangs out with some good people too. Thanks Sal, I want to hear more. Thanks, Sal, for posting these. I'm guessing that Concord has been aggressive in getting the word out on her -- album is scheduled for August apparently -- as Vin Scelsa also played a couple of tracks by her on this weekend's Idiots Delight.